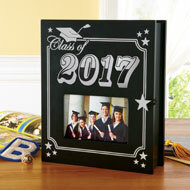 Now your graduate's special memories have the perfect place to be gathered.  This thoughtful memory holder displays a favorite photo on the front with the words "Class of 2017", while the inside has several slots for holding special souvenirs. Holds a 4" x 6" photo. Wood and plastic. 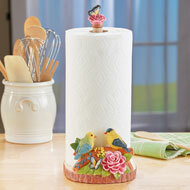 9 1/2"L x 3"W x 11 1/2"H.
This delightful paper towel holder features carefully handpainted details and plenty of charm. Colorful songbirds are perched atop a branch surrounded by beautiful flowers and a bright butterfly, while another butterfly sits at the top. Holds one standard paper towel roll (not incl.). Wood and resin. 6"L x 7 1/4"W x 14"H.
Beautiful colors and delightful details make this unique paper towel holder a lovely addition to your kitchen. 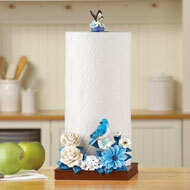 The colorful holder features a handpainted blue bird in a lovely flower garden with a butterfly accent on top. Fits a standard paper towel roll (not incl.). Resin, wood. 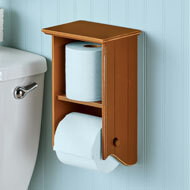 6"L x 7"W x 13 1/2"H.
This toilet paper holder adds a touch of charm and extra storage to your bathroom. A shelf above the holder fits an extra roll. Mounts easily to the wall with a sawtooth hanger on the back. Wood. 7"L x 5 3/8"W x 12 1/2"H.